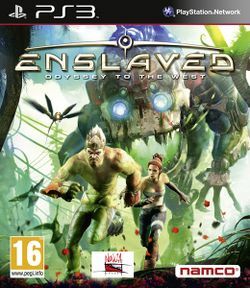 Enslaved: Odyssey to the West is a platform action-adventure game developed by Ninja Theory and published by Bandai Namco Games. It was released on PlayStation 3 and Xbox 360 in October 2010. Enslaved is a story set 150 years in the future where a global war has ravaged Earth, destroying much of the human race and leaving the world to be plagued by robots. Although they are from a bygone era, they are still following their programming and seek to completely eradicate humanity. The storyline is loosely based on the ancient Chinese novel Journey to the West. The main character in the game is called Monkey. He has spent his entire life running from the mechs and is a solitary man. Eventually Monkey is captured by the combat mechs, and is placed on an airship. It is there that he meets a technologically adept woman named Trip. Although they both escape the airship, Monkey gets knocked unconscious when crashing to the ground. When he comes to, he finds that Trip has placed a slaver's headband on him in order to compel him to help her get home. She explains that she has hacked the headband so she can give him jolts of pain at will; and further that if Trip's heart ever stops, the headband will kill Monkey outright. As they try to make their way back to Trip's village they must fight mechs that have been lying dormant for years. The two of them have a strained relationship, but in order to survive this perilous world they need each other's help.